Online criminals don’t seem to stop coining email extortion scams, the latest one scaring recipients with the “I greet you! I have bad news for you” message. 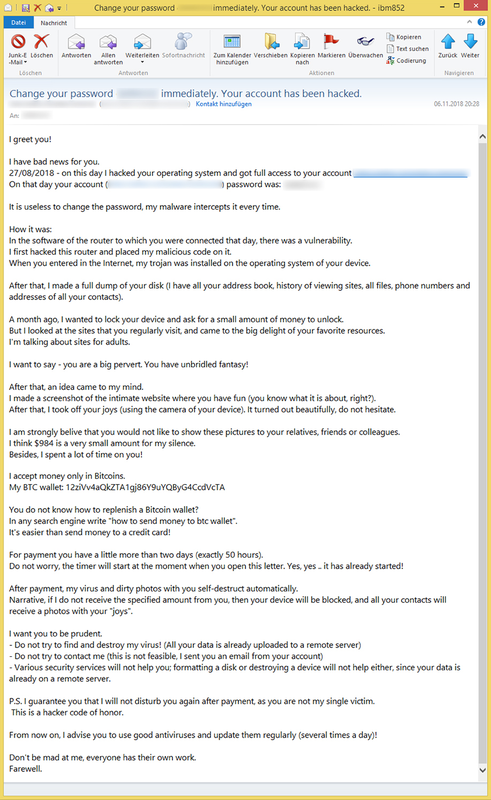 Bitcoin extortion scams circulating via email are definitely on the rise. Computer users all around the world are being massively shelled with deceptive messages threatening to disclose their ostensibly perverted deeds and fantasies. To prevent this from happening, the users are instructed to send a ransom in Bitcoin to the crooks. Such a major new trend might be stemming from some credentials leak that the criminals were able to get hold of. It may explain how the black hats know the victims’ email account passwords, which is the case in all such frauds across the board. One of the recent waves has to do with emails whose subject is “Change your password immediately. Your account has been hacked.” The introductory phrase in the body of this message goes, “I greet you! I have bad news for you” – something numerous confused users have been posting on security forums to get advice. The wannabe hacker’s story is prosaic and doesn’t differ much from the other frauds of this kind doing the rounds. The scoundrel says he had compromised a wireless router that the victim used on a specified date to go online. This sort of allows him to install a Trojan onto the user’s operating system and dump all data of their hard drive, including files, contacts, and Internet history. According to the rest of the message, the crook was up to locking the device completely a month ago to demand a ransom for unlocking it, but changed his mind after finding out what sites the user regularly visited, namely adult web pages. With that said, the self-proclaimed hacker states he has exploited the host’s built-in camera to make a photo of the user when he or she was visiting one of those sites, while also making a snapshot of the content being watched. To top it off, he threatens to send those photo compilations to all of the user’s contacts, emphasizing that it won’t happen if a ransom is paid. Its size is $984 worth of Bitcoin, or somewhere around that amount. The deadline to do so is 50 hours. So much for the hacker’s narrative.